It must be a sign of my advancing senility, but it was not until I was halfway into reading Die Bibliothek als öffentlicher Ort und öffentlicher Raum, the latest offering of the publisher BibSpider, that I realised that I was living within 8km of a library that presented a prime example of what the book was advocating. The theme of the book is that libraries need to be re-invented in order to meet the challenges of the changing technological and social climate. The library in question, the Central Library of the city of Norwich in the East of England, had, as a result of dramatic circumstances, been forced to re-invent itself in the 1990s. The Central Public Library, Norwich, built in the 1960s, was destroyed by fire in 1994. This event made it into the national news and there was a photograph of the burning building on the front page of The Times. Who said libraries were not important? 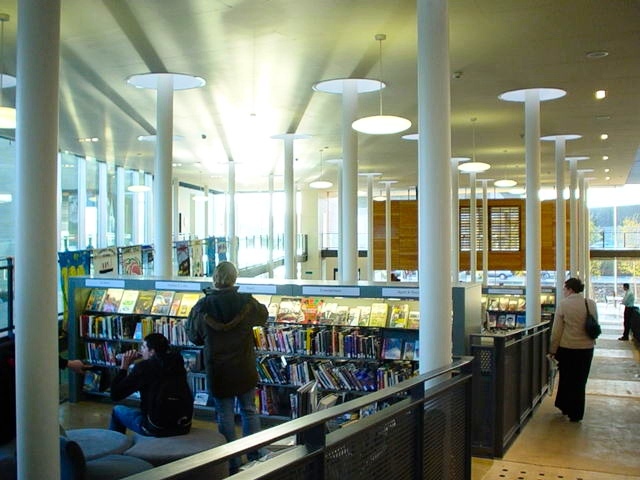 While the site was subject to intense archaeological investigation (artefacts were found from the time of the Viking invasions and right through the Middle Ages), there was a considerable amount of debate about what form the library would take when it was re-built. In the end it was decided that the building to be constructed would contain, not only the Central Library, but would be so constructed that other organisations could be housed within it, together with space being provided for exhibitions and other events. Work began on the new building in October 1999 and it was opened to the public in November 2001, with an official opening by the Queen the following year. The Central Library is now called the Millennium Library and is part of a complex known as the Forum. In front of the building is an open space in the form of a mini-amphitheatre. During the Christmas season it is turned into an ice rink. Beneath the building is a car park. Consideration was given to the special needs of disabled people, with ramps for access and lifts to all floors. The Forum is run by a Trust that organises events both inside and outside the building throughout the year. These vary from a farmer’s market, fashion shows, antiquarian book fairs, exhibitions, to concerts. The Millennium Library runs its own events – for example, activities for children, Internet taster, and teenage book groups. Within the main building there is a café bar, complete with a grand piano for music while the patrons sip their wine or coffee, a restaurant, tourist information centre, gift shop, learning shop offering advice on courses throughout Norfolk County, learning station specialising in IT courses, local newspaper shop, and a cash machine. A large area is occupied by BBC East for local radio and TV broadcasting. Every time I watch the local news on my TV I see a picture of the Forum building introducing it, and behind the newsreaders I can see people in the Millennium Library. Perhaps the most unusual thing in the building is something called Origins, spread over three floors and offering ‘an exciting interactive journey through 2000 years’ of local history. What of the library itself? This is quite extensive with shelving capacity to display 120,000 books, and, as well as providing the usual lending and reference facilities, has a local government information desk, a large picture collection charting the history and development of Norfolk, plus free access to over 100 PCs for use for computer work, sending emails and providing access to the internet. Computer access is available for people with disabilities. CD Roms and a community information database can be accessed. There are 220 study spaces. The library is open to the public seven days a week. An unusual feature of the library is a special collection, the 2nd Air Division Memorial Library, founded in memory of American service personnel who served in Norfolk and Suffolk during World War 2. Money was raised by members of the 2nd Air Division following the cessation of hostilities in 1945 to fund a library. The collection comprises material on American culture and World War 2 in the air, the emphasis being on the special relationship between the people of the UK, specifically East Anglia, and the people of the USA. When the library was re-opened in November 2001, some 200 US veterans were among those attending the ceremony. Some 2 million people visit the Forum each year. Its striking appearance and location in the busy centre of Norwich means it is a great attraction to locals as well as the many tourists who visit the city. On the occasions when I have been there it has always been busy and there has always been something new to see and experience. During a recent visit I noticed that there was always a queue at the general enquiry desk staffed by three librarians. I gather that this is fairly normal. Further information on the Forum, including some excellent photographs of the building, can be obtained at www.theforumnorwich.co.uk and on the library and its services at www.library.norfolk.gov.uk. Better still, come and visit the ancient city of Norwich, twinned with Rouen and Koblenz, and see for yourself. Michael Wells war Bibliothekar in zahlreichen Öffentlichen Bibliotheken u.a. in Singapur sowie Dozent an der LIS School in Aberystwyth (Wales). Heute ist er als Schriftsteller tätig.